Central African Republic with its capital Bangui is located in Africa (Central Africa, north of Democratic Republic of the Congo). It covers some 622,985 square kilometers (slightly smaller than Texas) with 5,625,120 citizens. French, Sango, Lingala and Kongo are the languages commonly used by the people in Central African Republic (consider regional differences). Cameroon, Chad, Democratic Republic of the Congo, Republic of the Congo, South Sudan and Sudan are bordering countries. Due to increasing rebel activity, travel here is strongly discouraged! Travel outside Bangui is strongly discouraged, including all land routes from Cameroon. The Central African Republic is at the geographic center of Africa. The climate is generally tropical. The northern areas are subject to harmattan winds, which are hot, dry, and carry dust. The northern regions have been subject to desertification, and the northeast is desert. The remainder of the country is prone to flooding from nearby rivers. The main language is French with a dialect called Central African French. To reach someone Central African Republic dial +236 prior to a number. The local cellular networks are operated on 900 MHz, 1800 MHz, 4G. Websites typically end with the top level domain ".cf". If you want to bring electric appliances (e.g. battery chaarger), keep in min the local 220 V - 50 Hz (plugs: C, E). The sign for the locally used currency Franc is XAF. 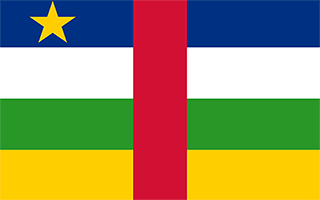 Four equal horizontal bands of blue (top), white, green, and yellow with a vertical red band in center; a yellow five-pointed star to the hoist side of the blue band; banner combines the Pan-African and French flag colors; red symbolizes the blood spilled in the struggle for independence, blue represents the sky and freedom, white peace and dignity, green hope and faith, and yellow tolerance; the star represents aspiration towards a vibrant future.